The neighbourhood of Yonge-St. Clair is part of Old Toronto, and has deep historical roots within the city. The Deer Park name that many use for the area has been in place since the 1830s, while Heath Street pays homage to the Heath family, who purchased 40 acres of the area back in 1837. Since those days, the area has modernized and urbanized, and now features rich residential hubs, bustling business centres, and a number of restaurants, entertainment venues and retail establishments. Everything you need is within a short distance from the major intersection that lends its name to the area. Though a little north of downtown Toronto, Yonge-St. Clair is packed with amenities that allow it to maintain a distinct big-city feel. It also benefits from an advantageous position in Midtown that makes it easy to get anywhere in Toronto without much hassle. In this sense, Yonge-St. Clair is an ideal location for anyone looking to eschew the noise and chaos of downtown Toronto while still looking for an immersive Toronto experience. Many people consider the epicentre of Toronto to be the Yonge and Bloor intersection, as these main roads separate east from west, and north from south. Yonge-St. Clair is a bit north - just under 30 minutes by foot and about five minutes by subway - from this intersection. The neighbourhood’s close proximity to the city’s central nexus gives residents easy access to the entirety of Toronto. Walk Score ranks Yonge-St. Clair as a “very walkable” area, with an 84/100. With shop-lined streets, vibrant side areas and some beautiful residences, travelling by foot in this region is both convenient and enjoyable. The Transit Score is equally impressive, coming in at 86/100. St. Clair station is the main hub for travel, being positioned both on Line 1 for the subway and the 512 streetcar line. Travel via car is also simple, with less traffic than downtown and less construction than the Yonge-Eglinton area. To get out of the city, exits to the 401 from the Allen or Bayview make good options. The Yonge-St.Clair neighbourhood sees a demographic shift when you leave the main roads for the side streets. In its busier places, the neighbourhood is mostly condos and apartments, while the more secluded areas host some seriously impressive detached houses. The following data was obtained from the 2016 Yonge-St. Clair neighbourhood census profile, and the City of Toronto Ward 22 profile. Average prices are determined by the realestatecondos.ca listings. 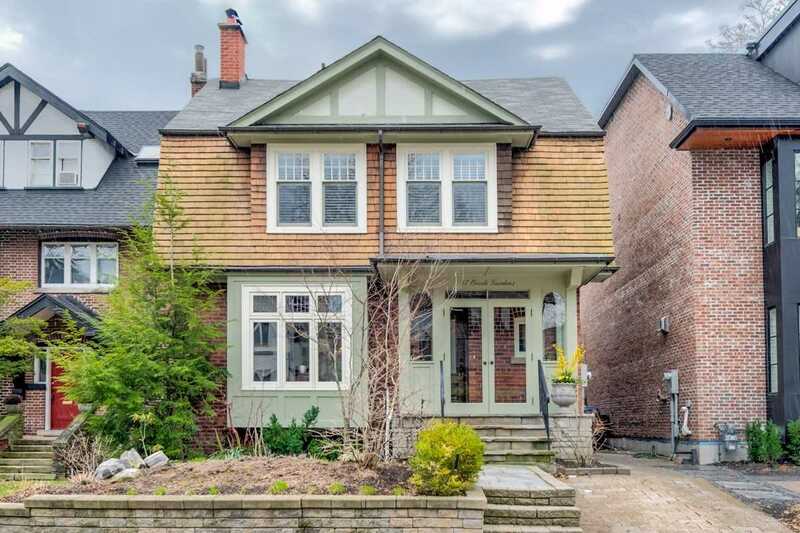 You’ll find most everything you could ever want in the Yonge-St. Clair neighbourhood. And if there’s something missing, you’re only a quick subway or streetcar ride away! You’ll have no issues finding everyday necessities in the area. In the vicinity of the Yonge and St. Clair intersection you will find a Shoppers Drug Mart, Dollarama and Sobeys. There is also a new Loblaws in the works, which will be attached to the subway station. If it’s retail you’re looking for, there are a number of chains, including a Roots at the intersection. The best shopping, however, lives in the small boutiques that line Yonge street. From Heath Street down to the Rosedale area, you will find a variety of unique clothing, shoe, accessory, furniture and decor shops. The area is home to a large number of pubs and upscale restaurants. If you’re a soccer fan looking for a prime spot to watch a match, you’ll want to head to Scallywags on St. Clair. It’s a great place to cheer on your team with other fans while enjoying some classic English pub decor, drinks and food. You will also find your classic cafes and coffee shops in the area, including Starbucks and Tim Hortons. If you’re looking for something a little different, check out JJ Bean, voted one of the best caffeine fixes in Midtown. If you’re not up for heading to the pub, you have options both north and south. The latter direction will see you wind up downtown, while a quick jaunt north gets you to the centre of Midtown: Yonge and Eglinton. There, you can visit a movie theatre, play board games at Snakes and Lattes or check out the local fare. If it’s nightlife you’re after, south is your best bet, as you’ll be headed to some of the most popular clubs and hangouts in the city. The area is an ideal spot for families, and is home to a number of wonderful public schools and prestigious private schools. Yonge-St. Clair offers both English and French oriented public schools, as well as a publically funded English-French Catholic school. These schools are run by the Toronto District School Board, Conseil scolaire Viamonde, and Toronto Catholic District School Board, respectively. Additionally, both De La Salle College and Upper Canada College reside in the area. Throughout the whole of the Yonge-St. Clair neighbourhood you can find plenty of greenery and spaces to stretch out on some grass. One of the biggest green spaces in the area is the St. Michaels Cemetery. While you wouldn’t head there for a picnic, it does provide scenic walking and running trails, and is a great way to enhance your morning commute, when heading to or away from St. Clair station. Oriole Park is another great option. It features a playground for kids, and a dog park for your furry friends to cut loose.